Traditionally the start of the Mont Blanc circuit is at Les Houches which is only a few kilometres from the centre of Chamonix. Geneva International airport is the closest international port to Chamonix being approximately 1.5 hours drive away. If you are not transferring from Geneva by vehicle there is also train and bus services available. The local bus service takes about 2.5 hours the train takes about 3. The train is the cheapest option but does require two service changes and takes the longest amount of time. There are also plenty of private transfer companies which are the most efficient option as they will take you straight to your accommodation from Geneva airport but these do require pre booking ( see Transfer companies). Expect to pay around 25 -40e pp for a shared vehicle transfer, more for a private one. The Tour de Mont Blanc is undeniably a challenging walk and we highly recommend adequate fitness training to ensure that you get the most enjoyment out of your trek and that you can complete each stage. The Tour de Mont Blanc requires a reasonable level of fitness and suitable walking experience. 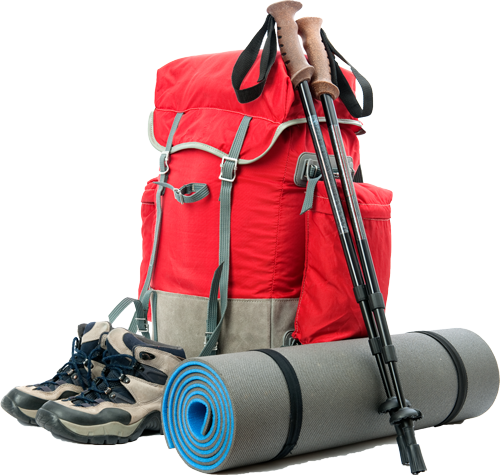 If you are trekking independently and carrying your own pack then you will also need to be more fit & self reliant than if you were part of a supported group. If you are thinking about walking the circuit and want to get advice before you book anything speak to one of the trekking specialists at RAW Travel, who can advise on aspects of the walk and whether you’d be suited to it. While there are options of cable-cars and chair-lifts, where available, to bypass a couple of the more difficult ascents and descents this should not be relied on as a way to bolster an underlying lack of trekking fitness. If choosing these options, when planning your trip, please note that they tend to only be operational during the seasonal months of June to September and do have closing times of around 5pm. Regardless of using the cable-cars and chair-lifts it is important to be as fit as possible as each stage has its own challenge. Along with steep ascents and descents there will also be sections of exposed footpath and so you should be comfortable and experienced with hill / mountain walking – this is not the place to start for a complete novice! In some sections above Chamonix there are short lengths of metal rungs and ladders or fixed cables and chains to aid in steep challenging pitches – though there are usually alternatives if you need to avoid these. You can choose to walk in the clockwise direction and the advantage of this may be that you miss walking with the crowds during the day and see new faces at the refuges each night, although if starting in Les Houches a disadvantage is an ascent of 1500m on your first day of walking. There are very few exposed or dangerous sections along the track and approached with care pose few concerns for the majority of experienced walkers. It is best to set off early on each days walking as weather can always be unpredictable and setting off in the morning will mean that you will be walking in the cooler part of the day with the greatest chance of clear views. Early in the season you will most likely find snow on the ground the higher up you are and caution should be taken in these sections. Weather in the Alps can turn at any time of year and you may experience snow fall above 2000 metres. Afternoon thunderstorms are common during June and July, this is another reason for starting your daily journeys early, and remember to always check weather forecasts. You should always make sure that your travel insurance covers emergency mountain rescue – this may not always be a standard feature on some policies so talk to your insurer and see you have an adequate level of cover as emergency rescue is very expensive! First of all: do not panic – stay calm and survey the situation. Do not take useless risks if the people in trouble are difficult to reach. Do not give up if the rescue team runs late, hold tight and take cover. 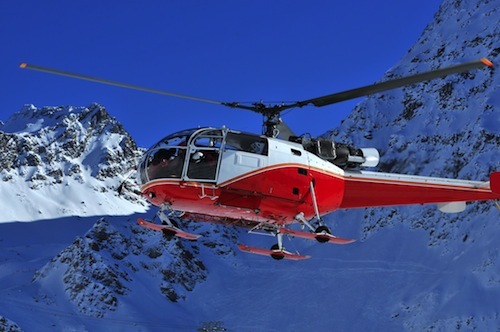 Check for any objects in the area that could be blown away by the helicopter’s rotor blades. As the helicopter approaches, crouch down and stay still until the rescue team disembarks. Trails can be covered with a considerable amount of snow even early in the season. 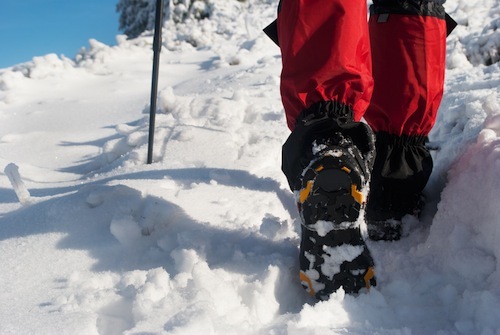 Beware of slipping hazards – if possible, bypass snowfields if they have even a minor slope and bring the proper equipment: crampons, ice-axe, telescoping poles, snow leggings. Another snow-related risk concerns difficulties getting oriented: heavy snowcover can hide trail markings and make it difficult to find reference points and landmarks, especially during bad weather. Use a compass and a map or even a GPS. Caution – following the tracks of other hikers can lead you even farther off the trail! Keep in mind that waterways can be covered by snow bridges that may collapse under the weight of one or more excursionists, so be careful whenever hiking near rivers, streams and gullies where water could wash down from snowfields. When a snow bridge has to be crossed, a safety line is recommended. Strong sunlight: You are exposed to more UV in the mountains than in lower altitudes, so while it’s pleasant to hike in shorts and T-shirts in warm weather be aware that you can quickly burn and get skin damage. Take care of particularly exposed body zones (face, ears, neck, scalp, hands). A compass, a map and an altimeter (and being sure you know how to use them) as well as a rescue whistle are handy in dangerous situations and can keep you from wasting significant amounts of time. In the presence of fog, proceed as a group and follow the trail signs meticulously (even if you already know the way). When visibility is down to a minimum, stop and wait for better conditions instead of venturing out with risky walks.